With a full kitchen on the first floor, our GARDEN COTTAGE allows you the choice of cooking your own meals or dining out in one of our many wonderful area restaurants. 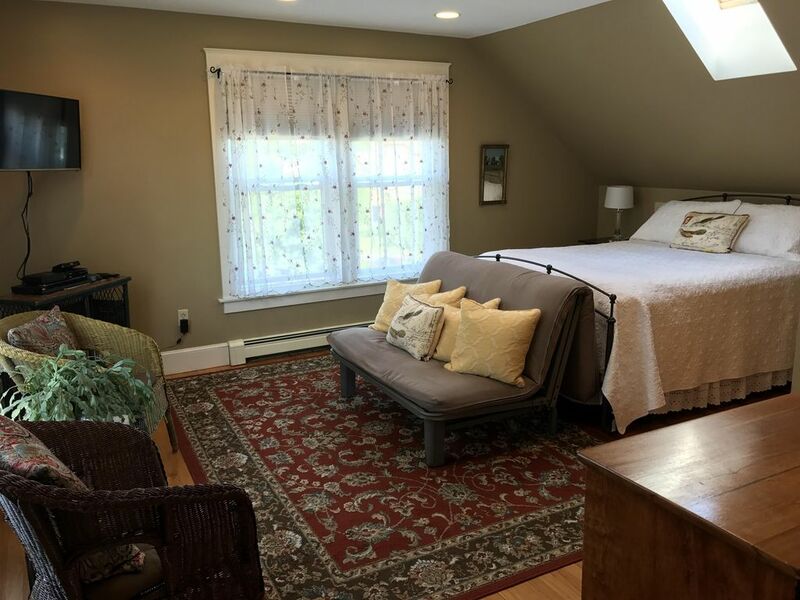 The second floor is ONE LARGE ROOM with a queen bed, convertible couch, sitting area, television, dvd player, small library, full bath, skylights and views of ALMY POND. This Cottage Apartment is rented for a seven night minimum stay during the summer months and monthly from September through May. The BEACH, the CLIFF WALK, the MANSIONS and SALVE REGINA UNIVERSITY CAMPUS are all within two blocks of us. DOWNTOWN NEWPORT is 3/4 mile to the north. Conveniently located for you to enjoy the summer's annual NEWPORT MUSIC FESTIVAL, NEWPORT JAZZ AND FOLK FESTIVALS. Stay with us, ride bikes and avoid the traffic. Come and surf, swim, fish, bike, paddle board, sail or just relax. Just spending the day sitting on the rocks by the water on the Cliff Walk or Ocean Drive can be a delightfully, relaxing experience. Enjoy our yard, and sleep peacefully in our quiet location when you return from your escapades each evening. We have always loved Newport and have found it amazingly beautiful, relaxing and exciting. Recently, Newport was listed on ABC GOOD MORNING AMERICA as one of the 10 MOST BEAUTIFUL PLACES IN AMERICA. Imaging living here! The URL for Good Morning America's Video can be found in a Google search using key words GMA's 10 Most Beautiful Places in America. My house and my Garden Apartment are on Almy Court, with views from the second floors that encompass Almy Pond. I chose this house by driving by one day many years ago and falling in love with it. It is a quiet area, lovely for walking. Just a few blocks down is Reject Beach, open to the public. It is part of Bailey's Beach, which is a private beach for the 'Summer Set'. Almy Pond at end of our dead-end street. Ocean 4 blocks down street. Dining nook is located on first floor adjoining the kitchen.